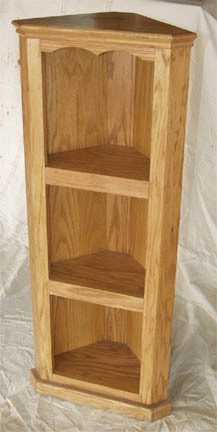 Attractive and functional, our solid oak corner shelf made by the Amish will fit nearly anywhere in your home! Perfect for the living room, office, den, bedroom or anywhere else you need an attractive shelf to store or display items. Similar to our Amish oak corner cabinet, but without the cabinet and doors on the bottom and designed to stand on the floor or any solid object. We can custom build it to any size you need, just give us your dimensions to receive a price quote.